Home › Information › Smaller size, smaller price, same BIG results! Superior Tank Solutions now offers a smaller electric mixer specifically designed for tanks between 20,000 and 1,000,000 gallons. The new model is 2/3 the size of current designs but will still significantly reduce thermal stratification, improve water quality, and increase chlorine distribution for homogeneous water quality. In addition, the mixer system will inhibit biofilm growth and prevent icing and related damage. The compact design lowers the price to the point it is now within the means of smaller districts with tighter budgets. New mixer is engineered to provide near-laminar-flow for long distance, non-turbulent mixing. For maximum efficiency the mixer to operates continuously creating a uniform flow of water throughout the entire tank structure. Instead of creating turbulence in the water near the unit, the new mixer gently and smoothly propels a wide, low velocity column of water from the bottom of the tank to the surface where it flows on the surface to the tank perimeter then back down to the floor. The near-laminar flow mixer can efficiently circulate up to 10,000 gallons per minute but still requires very little power. 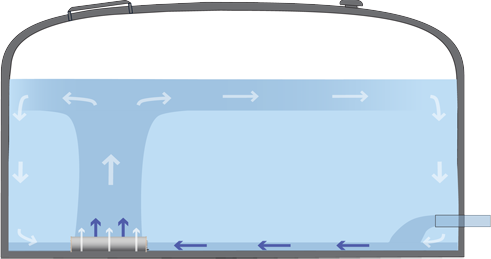 Proper water circulation throughout the tank ensures consistent disinfectant residual and uniform water age. When disinfectant is evenly distributed, the accuracy of testing samples is improved and correct results prevents over or under chlorination. A small investment in the installation of a new mixer can provide big results in the operating efficiency of your tanks. Superior Tank Solutions can professionally install your new mixer in the optimal position for greatest results. The new compact mixer with professional installation is surprising affordable and within the reach of most districts. 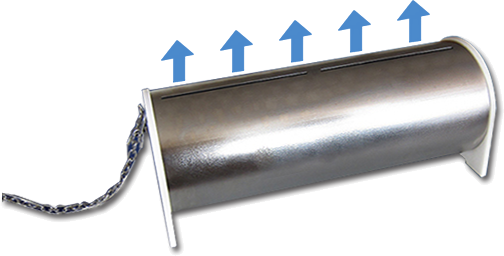 Improve the operating performance of your tanks with a simple and cost effective solution!